Presbyopia is the inability to focus on near objects. 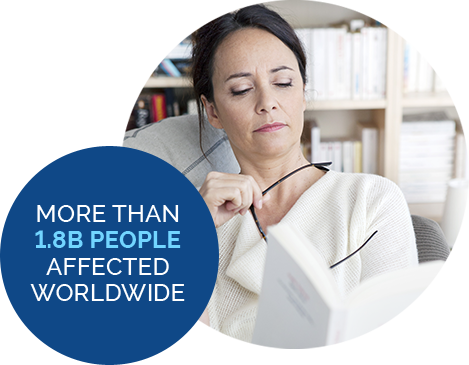 It occurs after the age of 40 and affects more than 1.8 billion people worldwide. 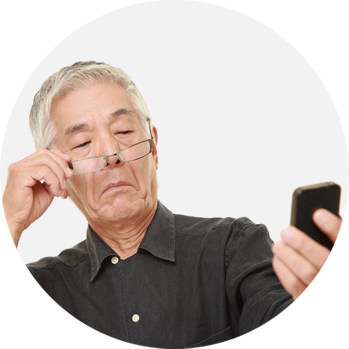 People with presbyopia experience blurred vision when performing daily tasks that require near visual acuity, such as reading a book, a restaurant menu or messages on a smartphone. Presbyopia cannot be prevented or reversed, and it continues to progress gradually. All existing treatment options are either cumbersome or invasive, presenting a significant unmet need for quality of life improvement for people with presbyopia. The standard of care for people with presbyopia is the use of reading glasses, which can be easily misplaced, lost, or broken. Reading glasses need to be replaced frequently as presbyopia progresses. They also carry the stigma of aging. Other less common treatment options such as contact lenses or surgical procedures are inconvenient, uncomfortable, and invasive.